← Ваши программисты работают в поте лица или просто ленятся? Все, кто уже узнал преимущества jabber‘a и как следствие отказался от icq, используют один из многочисленных клиентов, c GUI интерфейсом. Но наверняка мало кто использует консольный jabber клиент на FreeBSD, а ведь гиковски получается Поэтому будем ставить mcabber-Small Jabber console client. теперь выходим из root’a, заходим под обычным пользователем, ибо именно в домашней директории этого пользователя и будем создавать конфигурационный файл для работы установленного клиента. # - Leading and trailing spaces are ignored. # - Empty lines and lines beginning with a '#' are ignored. # you can specify your complete jid as username. # If password is not given, it will be interactively asked for. # If port is not given, default Jabber port will be used. # If you don’t know what a resource is, do not set it. # suffix to the resource name. # presence in your roster (default: 0). 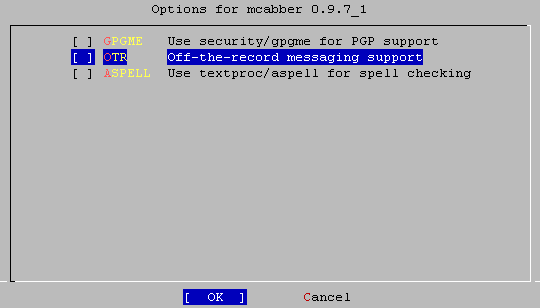 # mcabber is compiled with GnuTLS (only works with OpenSSL). # You can use mcabber -V to check. # NOTE: You probably need to set ssl_capath for SSL cert verification to work! # to generate hash links). # Set pgp to 1 to enable OpenPGP. # You can set your PGP passhrase here, although it’s NOT advised. # the username variable can be used. # The proxy_user/proxy_pass variables are optional. # can use the pinginterval. Setting this option to 0 disables the ping. # Default value is 40 seconds. # cs, de, fr, it, nl, pl, ru, uk. # For example, to display everybody the filter should be «ofdna_» (default). # To display only the connected buddies, use «ofdna». # running you can use «/roster display»). # Set disable_chatstates to 1 if you don’t want to use typing notifications. # Note: changing this option once mcabber is running has no effect. # (and status messages) to the log files (default: 0). # If you enable load_logs, you can use the ‘max_history_age’ setting below. # will not create it. # are used at startup time. # number of history days to load into memory with max_history_age. # so that the message flags are set back at next startup. # Note that ‘logging’ must be enabled for this feature to work. # about 8kB). The default is 0 (unlimited). If set, this value must be > 2. # to disable Last Activity reports only when the not-available status is set. # displayed in the status window (default: 0). # system (e.g. play a sound), have a look at ‘events_command’ below. # You can specify a script or process to be launched when an event occurs. # be run for a message to the current active window (default: 0). # the message (incoming messages only); the file name is the last parameter. # that mcabber won’t delete these files, it’s your script’s job. # (if it is defined) to the event script instead of the JID (default: 0). # exit value is 2. # occurs (for example when it connects to the server). # and the roster has been received. # mcabber can create a FIFO named pipe and listen to this pipe for commands. # in the log window (they will still be written to the tracelog file). # still read but it is discarded. # the status when it is «available» (online) or «free_for_chat». # containing your nickname in a MUC room. # The ‘message’ value will override all others, take care! # isn’t defined, the status message will stay unchanged. # the ncurses interface will await a character sequence. # The default is 1000 (1 second). # You can use the «default» color, too (i.e. for transparent background). # You can let mcabber color nicks in MUC. # option if you only want to see the username part. # is the local part of the contact’s jid. # Set ‘log_display_presence’ to 1 to enable. # Set ‘info’ to anything you’d like to see in your lower status line. # url in an incoming messages, it’ll print it to the log window. # disable PGP on a per-account basis. # Please note that the key must match exactly the id seen with /info. # Set otr to 1 to enable OTR support. # You cannot change this option once mcabber is running. # Set use_mouse to 1 to map mouse buttons like keycodes. # Sample alias to join mcabber channel with "/jmc"
вставив, конечно, свой логин, пароль и днс имя jabber сервера соответственно. Не забудьте раскоментировать строчку set password (нужно убрать символ # в начале строчки). Конфигурационный файл не очень сложен, стандартные вещи видны явным образом, например можно изменить порт для подключения к серверу (со стороны сервера должна быть такая возможность — подключаться клиентам на другой, нестандартный порт), set ssl = 0 —отключена сертификация; настройки прокси, на случай, если вы выходите в интернет именно через proxy-сервер. и самая нижняя часть — поле ввода сообщени и команд. После этого текст «текст_сообщения» будет передан выделенному пользователю. Mcabber так же работает на GNU/Linux, NetBSD, Mac OS X и Cygwin, поэтому можете использовать его на своей любимой операционной системе. Дерзайте!